Our Mission Statement: To promote the Love for and the Knowledge of the Bible as the Living Word of God. Through the Understanding of Scripture, we foster the Conversion of Heart, and the Building of Communities of Faith, founded on the Word of God. DVD-based Bible Study Courses with Study Guides and includes group sharing discussions led by Bat members/facilitators to reflect on the bible passages refered to in the video, using the material in the Study Workbooks. Participants come in prepared, having been given 'homework assignment' from the Study material the week before. Lecture style courses with Q&A. Our class is given the relevant Text of the Bible & complementary notes provided by the Speaker (soft copies) in this lecture style courses. 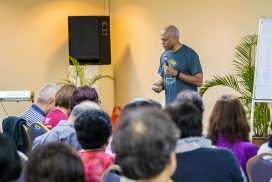 Our Speakers can be bible scholars like Msgrs Ambros Vaz, Rev Fr Eugene Vaz to name a few or run by our own team member using church approved sources of bible study material. Members meetings outside of Course sessions are not fixed & only called for to discuss directions of the Ministry, selection of course material or anything requiring group feedback or decisions. sfxBAT members are ordinary members of the parish; not bible experts but simply made up of people who have been touched by what they have found in the Bible and the enthusiasm to help spread the love of the Word of God. We derive a lot of personal growth from the preparations for our Bible classes and Bible retreats, which we hope to organize not only for sfxBat members but also our Bible study participants. Members joining us can help in different aspects of work: Program organiser, Facilitators for bible study discussions, Logistics (arranging snacks/beverage for classes) and A/V support.